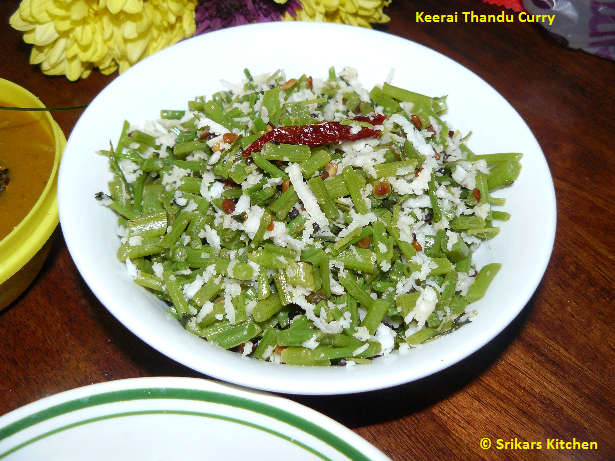 Keerai thandu poriyal - First time i am making this poriyal. It came out very well & tasted delicious..I love keerai thandu sambar & after making that sambar I had some left over so i came up with this which strongly resembles beans porial. Heat oil in a pan, add mustard seed, urad dhal, red chillies & allow to temper. Add keerai thandu ,salt and mix well. Add little water & cover with lid. & Allow to simmer & cook until soft. Serve with sambar, hot rice & ghee. Wat a healthy poriyal, can have simply with some rice and potato fry. Nutritious and delicious looking poriyal. Very colorful preparation indeed. SUPER PORIAL. HEALTHY TOO. THANKS FOR SHARING ! very healthy n should eat every one...vth rotis tastes yummy. Delicious keerai thandu throan love it. I make sambar with this but never tried poriyal. looks yummy..